This perennial plant is also grown commercially like ginseng, in the woods and under artificial shade. 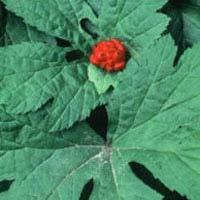 Goldenseal has been used for generations in medicine and is widely used today. Goldenseal grows about a foot tall with one or two leaves per plant, and flowers April-May, with a scarlet raspberry like berry cluster forming in the fork of the leaves. 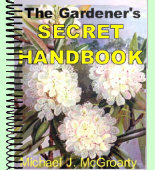 Its root is yellow when fresh and should be planted 2 inches deep and lightly mulched. Goldenseal needs 100% to 60% shade with 70% being best. It grows naturally in woods ranging from Vermont to Georgia, westward to Arkansas.